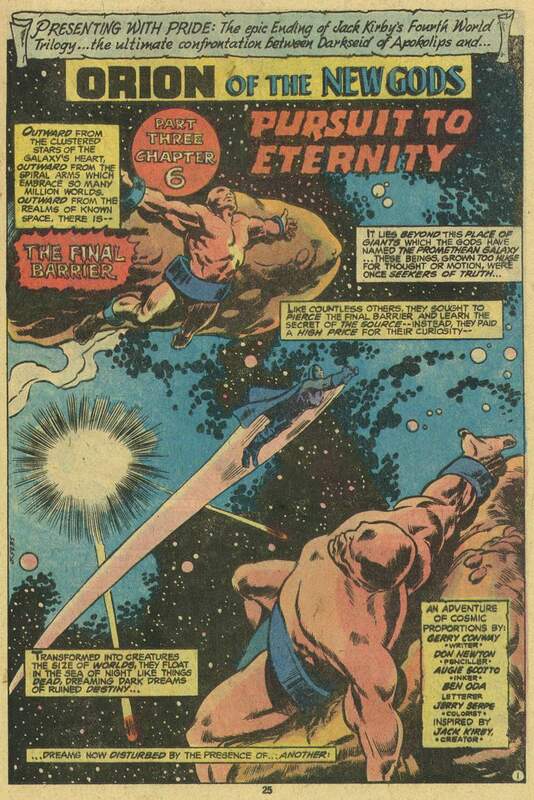 The ending of the epic by Gerry Conway and Don Newton, again inked here by Augie Scotto, gets no cover presence on Adventure Comics 460 other than a brief bit of text. It's an ignominious end for a grand saga unlike pretty much anything else coming from DC at the time. The art on this final installment feels rushed, much like the 8 page story itself. The story begins with Darkseid on his way towards the Final Barrier, flying through the field of the Promethean Giants that Conway seems to have a love to show. Yet where those Giants failed, Darkseid plans to succeed. He posits that his Omega Force coupled with the Anti-Life Equation will be enough to breach the barrier. He makes short work of the rock trolls and time storm we were presented with as threats back in Super-Team Family. He thinks to himself as he flies towards the barrier that, "when it falls, the cosmic secret will be mine!" Orion follows him from a distance, but our action quickly returns to the other events. On Earth, Metron realizes the recently arrived humans carry a Mother Box and a possible chance at victory. On Apokolips, Desaad prepares a cannon to destroy New Genesis once and for all. And on New Genesis, Highfather flies off after deciding his time of peace must come to an end for him to finish the battle once and for all. 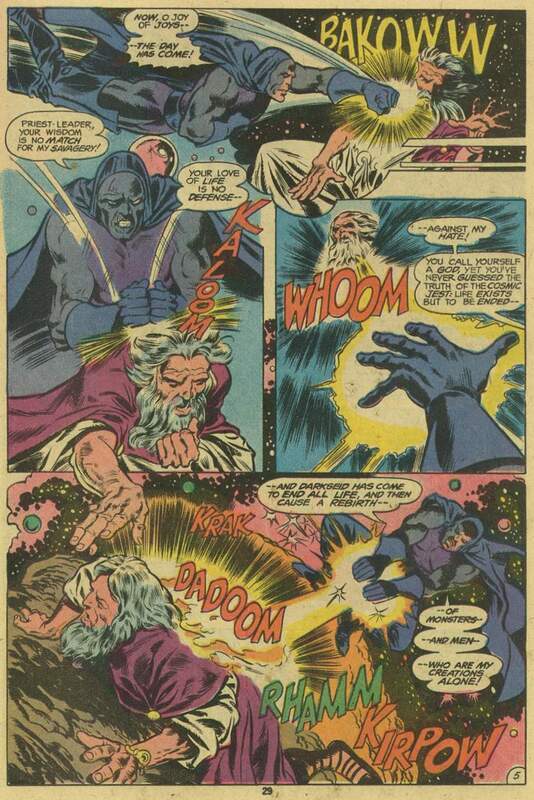 But Highfather doesn't fly off to confront Desaad and his cannon. Instead he faces off with Darkseid even as Darkseid seeks to breach the Final Barrier. The fight is brutal but swift and Darkseid stands victorious. He flies off to pierce the barrier. Darkseid vs. Highfather, the (not quite) final battle! Orion arrives to find Highfather down and injured. But even in his state, Highfather declares victory. For when Darkseid struck him down, he used a significant piece of his power. It would have destroyed any other New God but Highfather. And with his powers drained, Darkseid won't be able to break the Final Barrier. As Forager, Lightray and Jezebelle look on, Metron gathers the six humans that hold the Anti-Life Equation. With his guidance, they join their minds around the Mother Box and in doing so use their own hidden power to destroy the Antagonist once and for all. Orion flies off and confronts the weakened Darkseid. They trade blows, Omega Force versus Astro Force. In his weakened state, the Omega Force fails and strikes Darkseid. He's sent hurling into the Final Barrier without his protective powers, declaring as he falls that it means his annihilation. The Final Barrier spits him back out as a Promethean Giant himself, large and immobile. 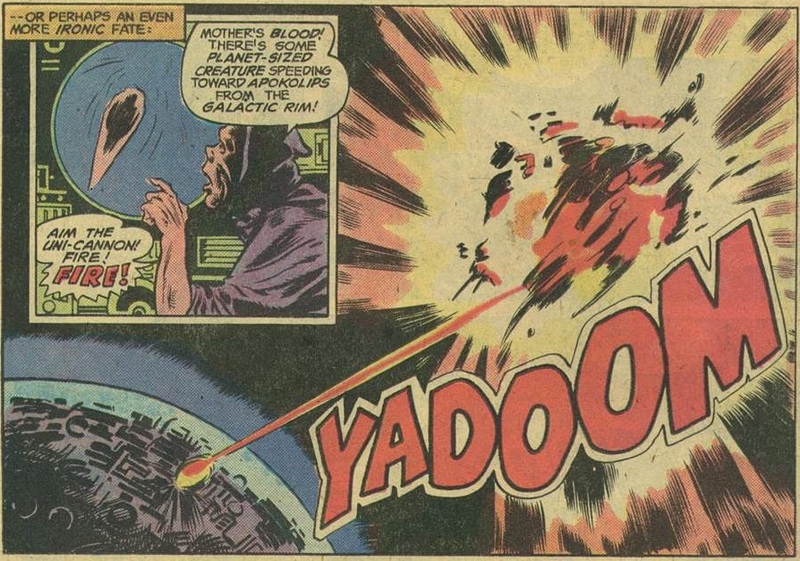 He collides with Desaad's cannon-ship, destroying it instantly and seemingly Darkseid with it. Darkseid and Desaad's super-weapon both meet their fate. The people of New Genesis celebrate their victory and the many subplots of the series remain forever unanswered. Unlike Kirby's initial work on this series, these issues are rarely used as reference outside a few bits Conway added to the mythology of the Source. It's a sad state of affairs because though uneven, these issues had some truly amazing art and story. During this revival, the writing talents like Conway, Englehart and Gerber showed different ideas than came before and since. The artwork of Don Newton, Marshall Rogers and Michael Golden all deserves a high gloss reprint on far superior paper. But alas, this era of the New Gods seems destined to the ether, never to be revived or thought of again. It's a sad fate, but I hope these last twenty-seven installments have at least made you consider seeking out a few of these stories for yourself. Thus ends the first phase of this site and the second phase of the New Gods. We will take a break for a couple weeks before we head into the 1980s and into an era of guest appearances, reprints and the return of the legendary Jack Kirby to his creations.